Fill a tote with freshly designed produce! Fill a tote with freshly designed produce! Invite early dramatic play, build vocabulary and reinforce good nutrition. Soft, rubberized plastic produce has a spunky look that little sprouts will love! 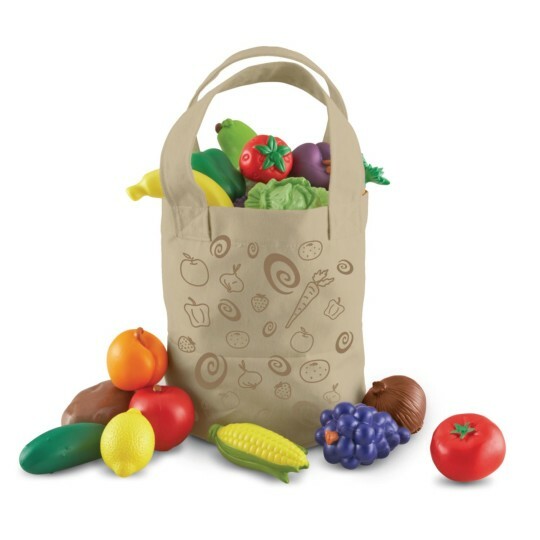 Durable canvas tote holds: red apple, tomato, strawberry, apricot, carrot, lettuce, pear, cucumber, berry cluster, plum, grapes, corn, banana, lemon, onion and potato. Tote measures 8"H x 9"W. 16 pieces. Toddlers (Ages 2+).